ClearCompany has processed millions of applicants, created thousands of hiring programs and taken hundreds of talent acquisition teams to the next level with their industry leading ATS, Sourcing Module, Onboarding Platform and Video Interviewing capabilities. For nearly two decades, we’ve been helping midsize companies transform the way they source, recruit, hire and onboard talent. We’ve brought you Talent Success University and our Talent Success Conference and of course, countless talent acquisition articles, hiring research and recruiting resources right here on this site. One of the biggest challenges in management is the performance review. In most organizations, it’s a critical part of performance management, and yet, more than half of employees say they have no impact on how they perform at work. Regardless of how your organization structures the performance review process, there’s no doubt the importance it has on the productivity and growth of your team. Even those companies who eliminate annual reviews do so by offering frequent performance conversations and one-on-ones as a replacement. The bottom line is an employee needs direction and redirection when it comes to performing at work. Only 14% of employees strongly believe their company’s performance reviews inspire improvement. So, how does a leader build performance reviews that engage and encourage the workforce? Employee reviews are all about having a two-way dialogue. The way of the traditional one-sided review is outdated. The collaborative effort of a successful review allows opportunity for an employee and manager to grow and learn from feedback. Traditional one-sided reviews are outdated. A more collaborative approach allows employees and managers to grow and learn from #feedback. What’s one key strength you think I should leverage more in my role? What’s one thing I can do to help us more effectively reach our goals? What’s one thing you thought could be improved and one thing you liked? What’s one thing I can do to better support you in your role? What’s one thing we can do to make our meetings more efficient? What’s the one thing you like most about your job? What’s the one thing you like least? Our best practices library has an entire section on performance management with key expert advice, toolkits and downloadable resources you can build into your very own performance strategy. Head over to the performance management section for more insight into improving your review process and more. Can you please explain to me what you believe the company goals, vision and strategy are? What is your personal role in the company goals, vision and strategy? What are your strongest motivators to come to work everyday? Name some things that de-motivate you about your position. Do you understand why we use the processes and practices in place? What would you change about those processes and practices? These questions will not only grant leaders insights to their workforce’s current state of alignment, but they simultaneously establish the opportunity to create transparency by discovering the answers to each of these questions together. More importantly, these questions offer true reflection for the employees. An emphasis on growth and progress helps them avoid emotions of frustration, anxiety or boredom often induced by inaccurate performance reviews. The more earnest and productive the interview, the more positive an experience the employee can have. Vigneron believes that the first step in conducting effective employee reviews is to “make the choice to live with your hands off of your ears.” Performance Management Software like ours can help streamline your performance appraisal process. Your HR team spends too much time organizing performance paperwork and tracking down completed reviews. There is a dependence on printed documents and Excel spreadsheets. Navigability can make or break the utility of performance management tools. A program can record all of your required data, but if it isn’t organized and presented in a digestible manner - what’s the point? True performance management tools get you excited about your company’s achievements. The right data enables leaders to make the best decision for their workforce. Meanwhile, employees can receive real-time feedback from their own dashboard. Traditional annual review cycle or not, performance management software can help coordinate, organize, schedule and store review information. The software will send reminders to leaders, manage permissions as leadership changes and provide structure to the overall process, including questions based on company values and the employee’s role. Peer feedback and 360 degree reviews, when performed correctly, reward the employee for positive performances. To make this happen, performance management software helps the review process move smoothly by providing structured and anonymous assessments. Often multiple people are involved in one employee’s performance review. This software tracks the feedback to enable the involved parties to provide the needed input in a timely fashion. One size does not fit all when it comes to assessment scripts. Managers, executives and employees each have their goals and values. This means that the annual review script must be personalized for each of these people. Therefore it makes sense that the software offers customizable scripts, scales and sections to fit the needs of your workforce. Transparency helps companies move through projects quickly and accurately. Leadership is able to follow projects through continuous performance and goal tracking and have a grasp on which employees are meeting their goals and which require some help. Real-time tracking enables clear communication between management and employees as well as department to department. Learn more about performance management software and how it can bolster employee performance for better business outcomes across the board! Sign up to speak with a performance management expert on our team to discuss your existing strategy and how leveraging the right performance management system can improve your entire organization. Employees want to improve themselves. They want to know how to work more efficiently and that their efforts are noticed. There are so many opportunities to keep an employee engaged. Once a year is not a perfect frequency considering 80% of workers want feedback in the moment rather than delivering aggregated feedback after months have passed. The implementation of regular employee feedback will motivate employees to stay engaged and productive. It’s impossible for a manager to remember an entire year of work and conduct a review off the cuff. If you are going to hold performance reviews, do them with higher frequency for the benefit of both the company and the employee. In addition, do not waste your time (or theirs) with an inconsequential review. Make sure you’re giving them real feedback and are prepared to direct your employees toward goals that will have a positive impact on your company. “59% of U.S. workers say communication is their team’s biggest obstacle to success, followed by accountability (29%).” 43% of highly engaged employees receive feedback at least once a week. Keeping up with employees often reduces turnover rates and increases overall productivity. 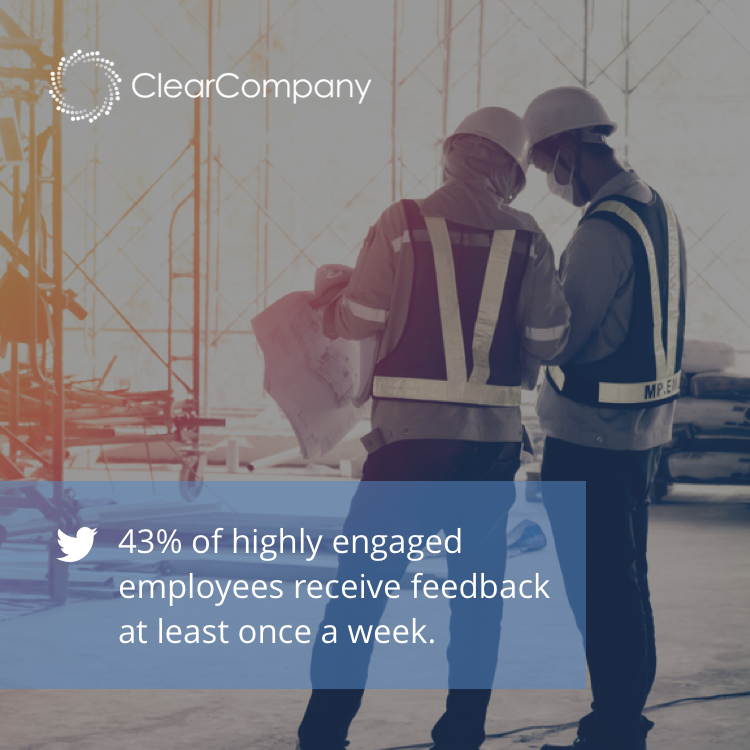 43% of highly engaged employees receive feedback at least once a week. Recognition is the mother of motivation. Seeing and hearing the value of what an employee does can be the most impactful thing in an office. When each person feels valued, they feel connected to their organizational goals and can confidently grow alongside their superiors. Implementing a performance review strategy is essential to the feedback demands of today. Annual reviews are deemed archaic, and the solution is in the proper performance management software that we provide. Sign up for a demo today and see how easy it is to give your employees the feedback they crave. When focused on productivity and numbers, it’s nearly impossible to understand the root of the problem if you’re not asking the right questions. Below, we explore how to identify issues and strategize long-term solutions to your productivity problems. You do not want to be the manager who sees an unmotivated team and decides to fire the problem away if it’s not necessary. Treat the symptoms, but focus on getting to the real cause to save the current and future A Players in your team. Do They Have Adequate Training? You might be used to delegating tasks, but are you certain your people are up to the challenge? There are multiple reasons an employee is underperforming, but with 95% of HR leaders pointing to employee burnout as a cause for workforce retention issues, we can assume there is reason to consider how far managers are pushing their team. Do employees need some of your time and energy for on-the-job training before they own a project? Maybe they have the skills, but do they have the bandwidth? An employee’s inability to hold their current workload can wear on your whole team’s productivity. Missed deliverables or deadlines lead to coworkers pulling additional weight or struggling to finish their own tasks. If relocating the work seems impossible, it might be time to consider your long-term workforce goals. Hiring new employees or reorganizing the employment strategy could be the more complicated, but necessary plan of action. Are They Motivated and Engaged? If the work isn’t making the employee hungry for more, why would they be interested in taking on another task? They can do the work you need them to, but unfortunately the small 12% of employees who are engaged can’t carry the lead. This is a much tougher problem to fix. There are a number of reasons an employee might be disengaged which means there are more than a few possible solutions. They may be feeling overworked, under-stimulated or undervalued. Take time to understand your employer brand promise and the job ads or descriptions you provide in the hiring phase. Are you keeping up your end of the deal? In the meantime, implementing a more formal employee recognition program can vastly increase engagement. 60% of companies fund at least four to six different types of recognition programs. Positive recognition from fellow coworkers always helps an employee keep on the right track. 60% of companies fund at least 4 to 6 different types of #recognition programs. You’ve hired someone else to share the workload. Your employees don’t hate their jobs, as far as you’ve assessed. Could something else be troubling your employees, causing them to be less productive at work? It could simply be a personal issue that is outside of your control. Sometimes life can be enough to push a worker’s motivations to the curb. It’s hard to tackle non-work related issues without feeling like you’re pushing too far into personal territory. You can, however, create a workplace where employees feel free to address their issues, even if it’s not a formal program. For example, give employees more options about when, where and how they work. A simple change in scenery or scheduling could help create an uptick in work productivity. The problem isn’t always the same and it’s not always so obvious. Even so, managers must attempt to fix the issues before productivity or team morale falls too far. In the end, a better connection to employee motivators and interests can become one of the most powerful tools for any manager to increase employee engagement. Need a better way to track performance? 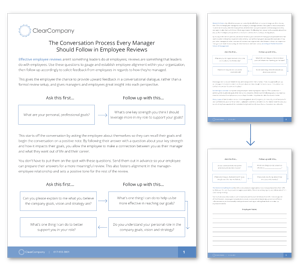 ClearCompany’s suite of tools gives you everything you need to track and manage productivity. Sign up for a demo today and we’ll show you the power of performance management. Talent management covers a lot of ground. It can be difficult to develop your talent management practices when you haven’t nailed down all of the various aspects of the subject. In this section, we break down the distinct areas then provide research and expert consultation to help organizations improve talent management. Take stock of your management team and the satisfaction levels of employees. Below we will dive into the 6 key areas of importance in talent management to help you increase employee engagement. Many organizations don’t realize just how impactful the connection between financial performance and company culture can be. An investment in a company’s culture is an investment in their organization’s bottom line. Ensuring there is a continuous supply of highly productive individuals involves encouraging them to stay. Some companies are even appointing CCOs (Chief Culture Officers). To help with this, you must first outline what your company culture needs to look like. What do employees value? What do you want to put emphasis on? After working together with your employees to develop a plan of action, take time to ensure everyone is on the same page. This collaboration on current culture can shine a light on what your employees love about working at your company while also bringing out a few of the weaknesses. Even better, your team can apply these findings to hiring initiatives which will help build a better idea of the employees who will work in the office and ensure your employer brand promise is accurate to reality. Company culture includes everyone! A talent management strategy needs a higher level of self awareness to properly address employee satisfaction. It’s impossible to resolve any employee problems without a means of hearing that they exist. In order to facilitate effective leadership development, an organization needs a strategic communication path. An employee satisfaction survey can offer clarity and organization while supporting and enhancing your unique company structure. This is a turnover danger zone. Lack of growth opportunities often top the list of reasons employees choose to leave an organization. Hopefully this is an issue of communication versus a true lack of growth opportunities. Regular goal setting meetings and similar communications between management and employees help progress immensely. Performance reviews, weekly meetings or regular emails are prime opportunities to share with your employees all of the internal growth options. A learning environment inside your workplace offers your employees a chance to better themselves, ensuring they are always using best practices and strategies. Not only do these employee growth opportunities better individual strengths, they also help evolve company culture towards an educational and intelligence-based environment. Some easy means of spreading company wide education include: webinars, online courses, an employee book club and conference stipends. The issue isn’t usually that management won’t provide the tools needed or employees to be successful, but rather they don’t have a process for employees to identify and communicate their professional needs. A culture that encourages feedback will help your entire workforce realize what their performance roadblocks are, together. This should begin as early as training and onboarding. Be clear with what tools your employees have at their disposal and ask if there is anything they are missing. There are endless technologies being introduced every day. A new piece of software, process or even computer hardware might completely change their ability to get multiple tasks done. The employee that can recognize flaws in the process might be the key player you need to overcome them. Sometimes it is invaluable to remind yourself that everyone likes to hear about a job well done. There isn’t a good reason for any manager to not recognize hard work everyday. People are constantly at odds with themselves and the various challenges of their day. This can be an obstacle for them, but an opportunity for you. Effective appreciation doesn’t have to be a grand gesture. Just a few words can help positively motivate an employee at any level and will ultimately increase productivity and performance. Your performance management system can offer additional easy ways to do this because it brings clarity to achievements and progress. As a manager or leader, you can get tangled up in your own tasks and other employee problems. Sometimes, those issues create a ‘fix first and thank later’ habit, and what’s put off very well might be forgotten or not mean as much down the road. With a performance management system, a job well done is right in front of your eyes. Even more, options to commend your employees are often supported through real-time feedback features. Employees have a tendency to trust each other before their managers. This means as much employee appreciation and feedback you give, you should encourage twice as much between your employees themselves. Employees want to say nice things to each other; they just need a platform. If there isn’t already something in place, consider encouraging it as a weekly email to one of their peers about something they did well. In-person recognition and small team meetings to celebrate big project completions are also great ideas. There are tons of possibilities when allowing your employees to appreciate one another, you just have to find what works best for you and your team. Who better to judge performance than those who are with you 40+ hours every week? A manager can’t see everything or be everywhere at once, so it’s no surprise that amazing things are missed. Peer-to-peer assessments make it easier for you to get an inside look while also providing your employees with some much needed praise or criticism. Remedying these common and costly workforce trends will mean reassessing investments in several areas of the organization. It is our recommendation that employers start with HR, the backbone of the talent management function. In order to fully utilize employee reviews, there must be a dialogue between leaders and employees. Here we’re offering a flowchart to help develop this conversation. Use these questions to gauge and establish employee engagement within your organization, then follow up accordingly to solicit feedback from employees in regard to how they’re managed. This gives the employee the chance to provide upward feedback in a conversational dialogue, rather than a formal review setup, giving managers and employees great insight into each perspective.